Students at Joplin Elementary said they're able to talk to someone at school to cope with the loss of Tyshawn Lee. Tyshawn was "targeted" for execution, possibly because of his family's gang ties, and lured into an alley from a nearby park while close to his grandmother's home in Auburn Gresham last week, police said. The killer is still at large, and police and community members are pleading with the public to come forward with information. A visitation for Tyshawn was held at Haven of Rest Missionary Baptist Church on Monday, where even Chicagoans who did not know the boy showed up to pay their respects. His classmates from Joplin, 7927 S Honore St., were invited to the funeral, which was held at St. Sabina Tuesday. 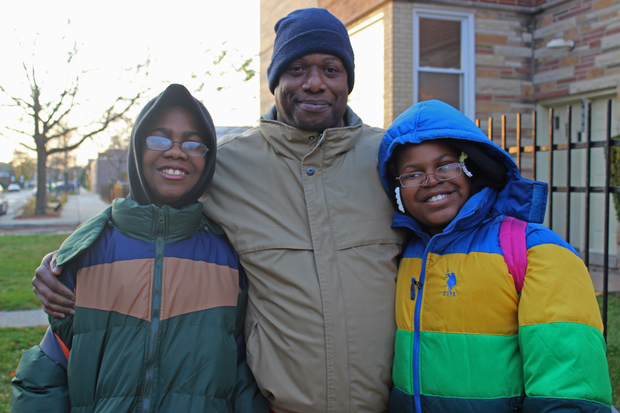 Joplin student Jarrell Driver (l.), his father Andre Garner and his sister Taneva Driver outside the school Thursday. 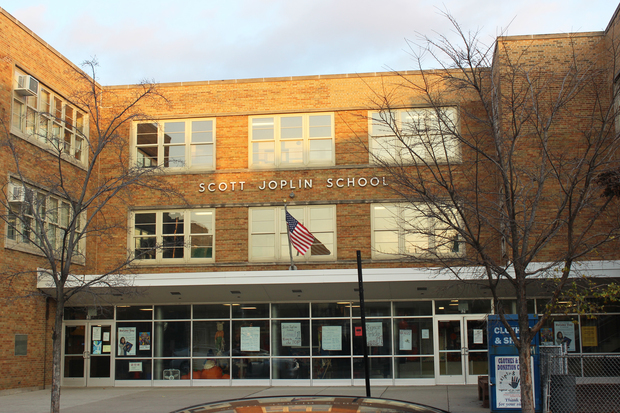 The loss of their classmate has been difficult for Joplin students. While the school didn't send a letter home with the kids, they were encouraged to talk to grief counselors about their feelings. “Everyone is feeling sad about what happened,” said Taneva Driver, 10. Taneva said the day after Tyshawn's slaying, people were crying at school, but she hadn’t heard the news yet. “I didn’t know what happened until my mother told me when I came home that day,” she said. Taneva said she didn’t know Tyshawn, but she saw him every day in passing and in gym class. Jarell said that it’s no secret that their school is in gang territory. He said that everyone knows who the gang members are, and he even pointed out a couple who were standing a few feet away, before his father Andre told him to put his finger down. “It’s a really bad gang situation, and they hang around here,” he said. Since the shooting, the school has beefed up its security. Several Chicago Police vehicles were seen parked on nearby corners Thursday after school. Safe Passage workers were posted at each intersection around the building. One worker said they’ll be out there until Wednesday. “The security around here, as far as the officers, is very good because they’re on each block,” said Keysha Warren, whose son is in first grade. “They make sure the kids are protected when they go in and outside the school. I think the officers are doing a great job,” she said. Warren, along with other parents, said they recognize the neighborhood isn’t the safest, which is why they limit the time they spend outdoors. “I just stay in the house, and if have to go to the store, I leave out early,” said Tomeka Jones, the mother of a kindergartner. She lives a block from the school and said there’s a lot of shootings in the community. The Rev. Michael Pfleger is hoping that someone with information about Tyshawn's slaying will step forward. "We've raised $55,000 so far as a reward for anyone with information on the murder,” he said. “We've gotten some very, very, very good leads; good information, but still waiting on that next jump,” he said, adding that he’s “confident” about an arrest.